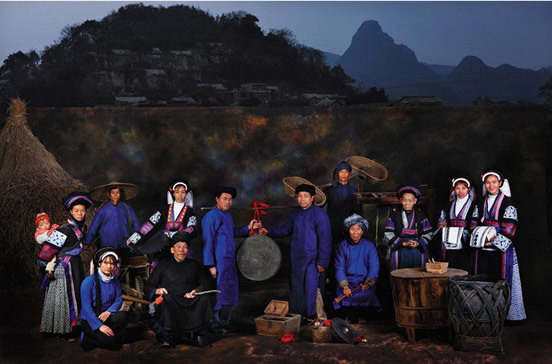 From the thundering waters of the Huangguoshu Waterfall to the sparkling stalactites of the Dragon Palace Cave, the Bouyei people’s ancestors were wise enough to settle the fertile plains of Guizhou over 2,000 years ago! There are currently nearly 3 million Bouyei people living in China, making them the 11th most populous of the 55 recognised ethnic minorities. Though they predominantly live in Guizhou province, small communities can be found in the provinces of Yunnan and Sichuan and the country of Vietnam. The Bouyei language is of Tai origin and is very closely related to that of the standard Zhuang language. It was originally accompanied by a writing system that incorporated and adapted Chinese characters. Tragically this writing system has since been lost, but a new writing system was developed in 1985 that uses the Latin alphabet. So even if you don’t understand the Bouyei words, at least you’ll recognise the letters! The Zhuang and Bouyei both trace their ancestry back to the ancient Luoyue people and their language, behaviour and customs are very similar to that of the Luoyue. Before the Tang Dynasty (618-907), the Zhuang and Bouyei were classed together under the term “alien barbarians” and appeared to be the same ethnic group. However, over time they migrated to different parts of China, developed their own unique cultures and, by the year 900 AD, they were recognised as separate ethnic groups. During the Qing Dynasty (1644-1912), the Bouyei and several other ethnic minorities suffered greatly under a landownership system that gave power and wealth to landlords but deprived the working class. Eventually this led to the Nanlong Rebellion in 1797, which resulted in many Bouyei people immigrating to Vietnam. Nowadays Bouyei people traditionally live in settlements near mountains and rivers. As a rule, most villages will have no more than 100 households and the village entrance is usually flanked by a banyan or camphor tree, as they are considered to be sacred. The Bouyei believe that these trees protect the village and bring the villagers good fortune. So next time you’re a bit down on your luck, you may want to consider planting a tree! 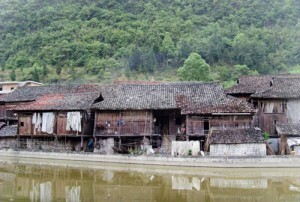 In many Bouyei communities the people live in a style of wooden building known as a Diaojiaolou. These are two-storey dwellings that are suspended on stilts, with the ground floor being used for storage and the upper floors being used as living spaces. However, the Bouyei villages near the Huangguoshu Waterfall, particularly Chengguan Town in Zhenning County, are particularly famous for an ingenious style of stone house. These stone dwellings are made without using cement and are built by simply layering specially cut flagstones in such a way that they create a natural, stable framework. In some cases even the roof will be made out of carefully placed stone sheets! Only the rafters will be made from wood and oftentimes-even furnishings, such as tables, stools, bowls, and cisterns, will be carved from stone. So you could say the Bouyei never made it out of the Stone Age!